The OR of the Future at Massachusetts General Hospital in Boston includes a wide array of medical devices. 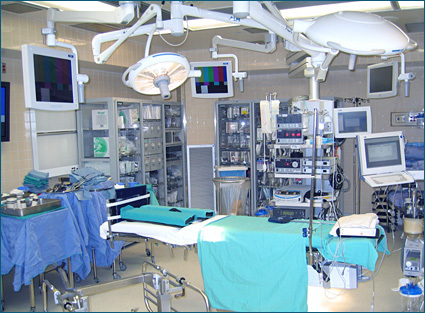 Medical devices are essential for the practice of modern medicine. However, unlike the inter-connected "plug-and-play" world of modern computers and consumer electronics, most medical devices used for the care of high-acuity patients are designed to operate independently and do not employ open networking standards for data communication or for device control. For years we have benefited from integrated systems to enhance the safety of potentially hazardous activities. For example, safety interlocks that require stepping on the brake before putting your car in gear, or having a clear alarm sound in the cockpit if the landing gear are not deployed when a plane descends for a landing, add "error resistance" to potentially hazardous equipment. But, the means is not yet available to easily achieve cross-vendor device integration to implement error resistance in operating rooms (ORs) and other clinical environments today. How could systems be made more error resistant? Consider, for example, the case of an anesthetized 32-year-old woman having routine gall bladder surgery, who had an x-ray taken during the procedure while her breathing was being supported by a ventilator. Such x-rays are common, and they require that the ventilator be turned off temporarily in order to minimize blurring of the image due to chest movement. In this case, however, the anesthesiologist became distracted by another problem in the OR and forgot to turn the ventilator back on, resulting in the patient's death. If the x-ray and ventilator were connected, the timing of the image could be automatically synchronized with respiration, so that the ventilator need not be stopped. This seems like a simple enough solution, yet we do not have this available today. Given sufficient resources, a hospital engineering group could interconnect the ventilator and x-ray, but "one-off" connections are complicated and expensive, and may be unreliable. In contrast, "plug-and-play" connectivity to integrate consumer electronics is commonplace today. Our consumer products rely on the ease and simplicity of standards-based plug-and-play to allow consumers to transfer digital photos, send email, use USB memory sticks, connect a Bluetooth headset, or interconnect home audio and video equipment. Medical device safety interlocks to produce error-resistant systems. Clinical decision support requiring real-time integrated clinical parameters and procedural context. Enhanced sensitivity and specificity of clinical alarm systems through the integration of physiological measurements, equipment status, and contextual information. Monitoring of device activity and performance. Automated system readiness assessment (prior to starting invasive clinical procedures). Support of remote-ICU surveillance and quality improvements. "Plug-and-play" modularity to support "hot swapping" of "best of breed" devices. Physiologic closed-loop control, e.g. of medication, fluid delivery, and ventilation. Real-time inventory of equipment for asset tracking, maintenance, upgrade, recall, and readiness assessment. Comprehensive data collection (like a "flight recorder") for the analysis of near-misses and adverse events. The importance of applying modern systems engineering solutions, such as interoperability, to improve patient safety and reduce costs was addressed in a National Academy of Sciences report (2005) entitled Building a Better Delivery System: A New Engineering/Health Care Partnership. However, cross-vendor standards-based interoperability has not been widely adopted for medical devices. Therefore, when device integration is required, customized device interfaces must be developed, which, in addition to increased costs and development time, are unlikely to provide needed functionality. APSF also recognizes that as in all technologies for patient safety, interoperability poses safety and medicolegal challenges as well. Development of standards and production of interoperable equipment protocols should strike the proper balance to achieve maximum patient safety and outcome benefit (Weinger, 2007). The Medical Device "Plug-and-Play" (MD PnP) Interoperability Program was established in 2004 to lead the adoption of open standards and technology for medical device interoperability to support clinical innovation. The term "PnP" was adopted because the required technology infrastructure has many elements in common with the plug-and-play approach used in other computer-based systems. The program is affiliated with Massachusetts General Hospital (MGH), CIMIT (Center for Integration of Medicine and Innovative Technology), and Partners HealthCare Information Systems, with additional support from TATRC (U.S. Army Telemedicine & Advanced Technology Research Center). Having evolved from the OR of the Future program at MGH, the MD PnP program remains clinically grounded. The program has been convening diverse stakeholder groups (clinicians, biomedical and clinical engineers, healthcare delivery systems, regulatory agencies, medical device vendors, standards development experts) to learn from past efforts to develop medical device interoperability solutions, to harmonize with current synergistic programs, and to elicit clinical scenarios for "improving healthcare through interoperability." Since the program's inception, more than 600 clinical and engineering experts, and representatives of more than 85 institutions that share a vision of medical device interoperability have participated in ongoing convening activities. To date, the MD PnP program has convened four plenary meetings to bring stakeholders together for information exchange and discussion of issues related to achieving medical device interoperability. The FDA hosted the second meeting so that regulatory issues could be more thoroughly explored with increased FDA participation. 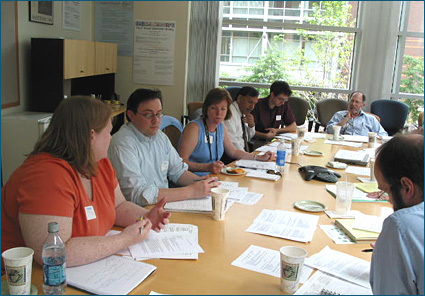 The most recent plenary meeting was the Joint HCMDSS1 / MD PnP Workshop held in June 2007, which added academic embedded systems experts to interact with stakeholders, attracting 145 attendees. This workshop brought together two highly synergistic research communities (MD PnP and HCMDSS), included a panel of federal agencies (NIST, NSF, NIH, TATRC, FDA), and had as the opening keynote speaker Dr. Robert Kolodner, the National Coordinator for Health IT, generating a more solid connection with the national health IT agenda. These plenary meetings have been sponsored jointly by TATRC and CIMIT and by TATRC and NSF through conference grants, and by the FDA. Smaller working group meetings have been held to develop program strategy, to work on clinical requirements methodology, to develop interoperability use-case demonstrations, and to work on standards. Our web site (http://www.mdpnp.org/) has provided online discussion forums and information about the program, including streaming video of the talks from the May 2004, June 2005, and June 2007 plenary meetings. The concept of medical device interoperability is not new. In fact, there have been several earlier efforts to move in that direction, and we have summarized this history in previous publications (Goldman, et al., 2005; Schrenker, 2006). However, none of these prior efforts has met with broad success. Through our conferences and working group meetings, the MD PnP program has identified several causes for historical failures to achieve widespread adoption of interoperability, including the absence of industry-adopted interoperability standards for data communication and device control, and lack of an appropriate "plug-and-play" system architecture (due to emphasis on proprietary solutions). In addition, there have been regulatory concerns and liability concerns that have to be addressed, the few available use cases have been poorly articulated, and the business case for interoperability often conflicts with single-source and end-to-end solutions. These barriers underscore the need for an integrated clinical environment "ecosystem" that would include system functions such as data logging, data security, device authorization, and connectivity to the hospital information system. These functions would contribute to a complete systems solution that could meet clinical, technical, regulatory, and legal requirements. The CIMIT MD PnP Lab opened in May 2006 to provide a vendor-neutral "sandbox" to evaluate the ability of candidate interoperability solutions to solve clinical problems, to model clinical use cases (in a simulation environment), to develop and test related network safety and security systems, and to support interoperability and standards conformance testing. This 500-square-foot facility is outfitted with a high-speed virtual medical network provided by Cisco Systems and installed by Partners HealthCare Information Systems, with access to a patient database of mock EHRs that can be used for testing. In the Lab, we are working with collaborators on the development of demonstrations of interoperability-based patient safety improvements, e.g. improving the safety and quality of portable x-rays and of patient-controlled analgesia systems that are used for pain management. 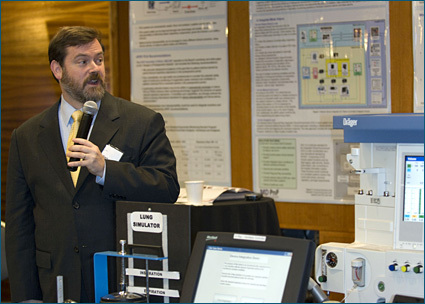 We have developed and demonstrated scientific exhibits showing how interoperability could improve patient safety in common use cases, showing these at the 2006 and 2007 annual meetings of the American Society of Anesthesiologists (ASA), at HIMSS07 (the Health IT and Management Systems Society), and at the 2006 and 2007 CIMIT Innovation Congresses. These exhibits include a demonstration of how medical device interoperability could enable automatic synchronization of x-ray exposure with ventilation, so that there is no need to turn off the ventilator to obtain the x-ray, and a demonstration of how continuous monitoring of a patient's SpO2 and respiratory rate could detect the onset of respiratory depression, and automatically stop the PCA infusion pump, lock out any further doses, and activate the nurse call system. We are currently working on a further variation of the PCA use case demonstration for a scientific exhibit at HIMSS08. The kinds of resources we are developing in the MD PnP Lab will make it a unique and useful resource for others. A long-term goal of the program is to have the Lab evolve to serve as a national resource for medical device interoperability work. The MD PnP program has built a multi-disciplinary, multi-institutional team to develop and implement a strategy to address the historical barriers and develop the building blocks or "legos" for interoperability through collaborative projects. Our geographically dispersed team of collaborators includes participants from Kaiser Permanente, the FDA, the University of Pennsylvania, Dräger Medical Systems, Draper Laboratory, LiveData Inc., Mitre, DocBox Inc., the University of New Hampshire, IXXAT, NIST, NSF, and Geisinger Health System, as well as the Partners HealthCare System community (Massachusetts General Hospital Anesthesia, Biomedical Engineering at MGH and Brigham & Women's Hospital, and PHS Information Systems). One of our projects has examined the MD PnP program as a social network, which has evolved over the past 3.5 years from a simple network of 85 people connected primarily to the program leadership, to a larger, complex "smart" network of over 600 people with many connections to each other and who are constantly forming new clusters as they collaborate and bring new people in. At the CIMIT Innovation Congress in November 2007, Dr. Julian Goldman demonstrated how patient safety could be improved by synchronization of the x-ray exposure with the ventilator during surgery. Our primary program activities are centered around clinical requirements, standards work, interoperability contract language, and regulatory issues. Eliciting high-level clinical scenarios to define user requirements to drive and inform interoperability solutions. The need to start with clinical requirements was identified early by all stakeholder groups as critical to the creation of a clinically valid standardization framework. To gather these clinical requirements, we held several focus group sessions at medical and engineering society meetings, beginning in the first year of the program and then on an ongoing basis. Participants have included anesthesiologists (from the Society for Technology in Anesthesia, and the American Society of Anesthesiologists), surgeons (from the Society of American Gastrointestinal Endoscopic Surgeons), and clinical and biomedical engineers (from the Association of Advanced Medical Instrumentation). Each of these groups brought unique perspectives on what interoperability of medical devices could contribute to patient safety and workflow efficiency in the OR and other high-acuity settings, and on what the "ideal" system should look like and how it should behave. Additional focus groups will be held with nursing staff and DoD clinicians, and we expect to work with collaborators on a web-based tool for collecting clinical scenarios that would benefit from interoperability. Developing a reliable repository of interoperability use cases that can be shared with other groups. The raw input from focus group sessions was organized into a repository of defined clinical scenarios or "use cases," which were presented back to earlier participants for refinement and then used to elicit feedback from new clinical sources. This repository is being further developed in conjunction with the FDA to highlight safety-critical aspects and requirements for interoperability. The use cases in the repository will be used to test interoperability functionality developed by device vendors using standards. Developing a clinical requirements methodology that enables use case scenarios to be specified at the level of detail needed to derive engineering requirements. As part of our clinical requirements work, we are developing a methodology that incorporates clinical workflow information and also identifies non-clinical requirements (performance, interfaces, functional and "non-functional"). The clinical requirements will be further refined to generate engineering requirements and specifications, which will then inform the identification of candidate systems and standards. Supporting the implementation of open networking standards to accelerate medical device interoperability. To achieve adoption of a standardization framework for medical device interoperability that has the support and buy-in of industry, there must be an open standards development environment. An independent, vendor-neutral program can act as the catalyst to bring the makers of proprietary software and systems to the table together with their clinical customers and government regulators to achieve this goal. The first step is developing standards for a patient-centric "Integrated Clinical Environment" (ICE) to define the ecosystems in which interoperability can be successful. A collaborative relationship with Draper Laboratory resulted in the participation of several senior Draper engineers, who in June 2006 wrote the preliminary draft of the multi-part ICE standard, which embodies the elements of the overall technology ecosystem needed to safely implement networked medical device systems. In six working group meetings over the past year, we convened engineers and standards experts from Partners HealthCare System, the FDA, Draper Lab, Dräger Medical, Mitre Corporation, and Philips Medical to prepare ICE Part I (network control), which was then submitted by the U.S. Technical Advisory Group in September 2007 into the ISO/IEC international standards development process. Extending the use of this kind of contract language is a current focus of the MD PnP program. Partners HealthCare is currently considering the use of such language, and other healthcare delivery organizations are increasingly expressing interest. Defining a safe, "least-burdensome" regulatory pathway for patient-centric networked medical devices, in partnership with the U.S. FDA. An early assumption of this program has been that the goal of medical device interoperability standardization can only be achieved by working closely with the FDA and other regulatory agencies, and this has been our approach to date. The mutual objectives of the FDA and the MD PnP program are to assure patient safety and to identify a regulatory pathway that will support the MD PnP concept, i.e. that will not require re-validation or re-clearance of the entire system as each new independently validated device is added to the MD PnP network. What is needed for success? Published consensus standards are only one of the ingredients required to achieve interoperability solutions. Other ingredients include the availability of reference implementations of standards such as IEEE 11073 and ICE, interoperability and conformance testing tools, a vendor-neutral testing and evaluation environment (as outlined above), and a safe regulatory pathway. Also, we need a staged implementation plan that recognizes the need to accommodate legacy systems, in order to support widespread adoption of standards-based medical device interoperability. Clinically meaningful, market viable, use cases. Open interoperability standards to enable these use cases. Reference implementations of the standards and related system architecture. Standards profiles or guidelines to describe how to use the standards to achieve interoperability. Business conditions that support interoperability. Interoperability compliance testing (formal and/or informal). Promotion (marketing, education, conferences, evangelists). The MD PnP clinical requirements working group discusses collaborative projects. Shown are (left to right): Tracy Rausch (DocBox Inc.), Rob McCready (Mitre Corporation), Heidi Perry (Draper Laboratory), Shankar Krishnan and Philippe Cortes (Mass General Hospital Biomedical Engineering), Bill Weinstein (Draper), Harry Sleeper (Mitre). Clinicians can contribute clinical scenarios (or "use cases") to ensure that new interoperability standards and technology will enable meaningful clinical solutions. Diversity of use cases should increase the likelihood of effective and generalizable solutions. Engineers can analyze clinical use cases to generate functional specifications, assess current standards to perform gap analyses, and evaluate proposed technologies. Diverse engineering expertise is essential. Healthcare delivery systems can specify performance requirements, and require adherence to medical device interoperability language in vendor contracts. Standards for interoperability will happen only when there is strong consumer demand. Regulatory agencies can create new paradigms for regulatory clearance of interoperable medical devices. Medical device manufacturers can participate in the development and adoption of interoperability standards, and partner with the MD PnP Program to develop a shared interoperability testing environment. Interoperability promoting organizations can support revising existing standards to meet clinical requirements, collaborate on clinical use-case implementations in the MD PnP Lab, and ensure that through collaboration we shepherd the adoption of medical device interoperability to empower innovation in the safety and efficiency of health care. By engaging in a dialogue with each other about the implementation of interoperability, and by working together collaboratively, these diverse constituencies can ensure the best outcomes for patient safety. Getting connected for patient safety isn't just about the devices  it's also about the collaboration. At its annual conference in November 2007, CIMIT named the Medical Device Plug-and- Play team, led by Julian M. Goldman, MD, of Massachusetts General Hospital, as the recipient of CIMIT's annual Edward M. Kennedy Award for Healthcare Innovation. The Kennedy Award was established in 2002 to recognize the exceptional and unique contributions made by interdisciplinary collaborations in bringing technology to health care. It is given each year to recognize an outstanding CIMIT team whose work over the past year embodies the CIMIT mission of collaboration to make a significant difference in healthcare through innovation and technology. The Award honors the Massachusetts senator, who has been a pioneer in healthcare and a tireless supporter of innovation and technology research. 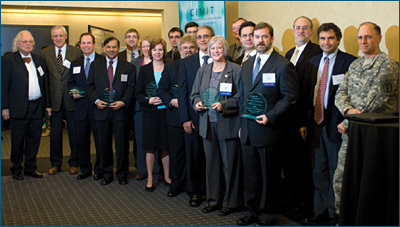 The MD PnP team, which is multidisciplinary and geographically dispersed, is the largest team to receive the award and represents the largest number of collaborative organizations, including the University of Pennsylvania, MITRE Corporation, Kaiser Permanente, Brigham and Women's Hospital, Massachusetts General Hospital, the US Army Telemedicine & Advanced Technology Research Center, Draper Laboratory, DocBox Inc., LiveData Inc., IXXAT USA, Dräger Medical, Philips Medical Systems, the Food and Drug Administration, and CIMIT. The team is committed to working collaboratively to ensure interoperability of medical devices in the OR and other clinical settings. That means that all devices and electronic systems are linked, so that information is exchanged and mistakes are minimized. "Each year there are accidents and unnecessary deaths in operating rooms," said Dr. Goldman. "Each OR has many kinds of electronic systems, many of which don't interact with each other. One of our key goals is to make sure all medical device systems can communicate, and to create international guidelines so that planners and administrators can create a failsafe hospital infrastructure." Susan Whitehead is the program manager of the Medical Device Plug-and-Play (MD PnP) Interoperability program at CIMIT (Center for Integration of Medicine and Innovative Technology), a consortium based at Partners HealthCare in Boston. She coordinates collaborations, communications, and projects for the multi-disciplinary, multi-institutional MD PnP program, which includes a growing network of more than 600 individuals and 85 institutions. A graduate of Rice University, Ms. Whitehead has worked with computer applications in healthcare settings during most of her career, primarily for Bolt Beranek and Newman Inc. (BBN) in Cambridge, MA. At BBN she managed a major project (CLINFO) that provided NIH-sponsored General Clinical Research Centers with a time-oriented clinical database designed for research, and coordinated other projects ranging from information commerce in a multi-practice clinic to evaluation of the NIH Division of Research Resources by a multidisciplinary panel of experts. She also managed a Technical Support group for BBN Software Systems, and led and trained TQM quality improvement teams at BBN and at PictureTel Inc. Prior to joining CIMIT, Whitehead managed research operations for the Digital/Compaq/Hewlett Packard East Coast research lab. She recently moved from industry into the healthcare sector in order to pursue her interest in applying technology to healthcare information. Whitehead may be contacted at swhitehead@partners.org. Julian Goldman is director of the program on Interoperability at CIMIT (Center for Integration of Medicine and Innovative Technology), a practicing anesthesiologist in the Massachusetts General Hospital (MGH) "OR of the Future," and a physician advisor to Partners HealthCare Biomedical Engineering at MGH. He is the director of the Medical Device "Plug-and-Play" (MD PnP) Interoperability Program, which he founded in 2004 to lead the adoption of open standards and technology for networking medical devices to support high-acuity clinical solutions for improving patient safety and healthcare efficiency. Goldman received his MD from SUNY Downstate Medical Center in New York, and performed anesthesiology residency and research fellowship training at the University of Colorado School of Medicine in Denver. He departed the University of Colorado as a tenured associate professor to work as vice president of medical affairs of a medical monitoring company, and joined Harvard Medical School and the Departments of Anesthesia & Critical Care and Biomedical Engineering at MGH in 2002. Goldman recently served as an officer in the FDA Medical Device Fellowship Program, chairs the Use Case Working Group of the Continua Health Alliance, leads several ASTM, ISO, and IEC medical device standardization activities, and is a founding member and immediate past-president of the Society for Technology in Anesthesia. He may be contacted at www.jgoldman.info. Goldman, J. M. (2005). Getting connected to save lives. Biomedical Instrumentation and Technology, 39(3), 174. Goldman, J. M. (2006, May). Medical device connectivity for improving safety and efficiency. American Society of Anesthesiologists Newsletter, 70(5). Goldman, J. M., Schrenker, R. A., Jackson, J. L. & Whitehead, S. F. (2005). Plug-and-play in the operating room of the future. Biomedical Instrumentation and Technology, 39(3), 194-199. National Academy of Engineering & Institute of Medicine. (2005). Building a better delivery system: A new engineering/health care partnership. P. P. Reid, W. D. Compton, J. H. Grossman, & G. Fanjiang (Eds.). Washington, DC: National Academies Press, Recommendation 4-3. Schrenker, R. A. (2006, April). Software engineering for future healthcare and clinical systems. IEEE Computer, 39(4). Weinger, M. B. (2007, Winter). Dangers of postoperative opioids: APSF workshop and white paper address prevention of postoperative respiratory complications. APSF Newsletter.